For larger organizations with many people involved in the publishing process, user roles help keep your team working smoothly. Currently, the most important uses of user groups are Notifications and Permissions. On this new “Roles” screen, you can create new roles and edit existing roles. 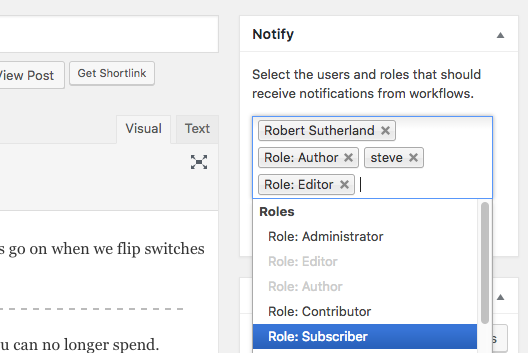 In the image below, you can see the default WordPress user roles. From the main “Users” screen in WordPress. From inside each user’s account editing screen. 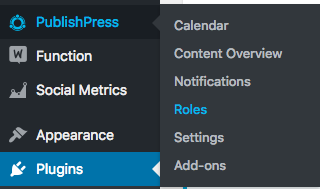 If you go into the “Notifications” area of PublishPress, you’ll see that your Roles are available in the “Who to notify?” section. There is also a “Notify” box in the sidebar on the post editor screen. 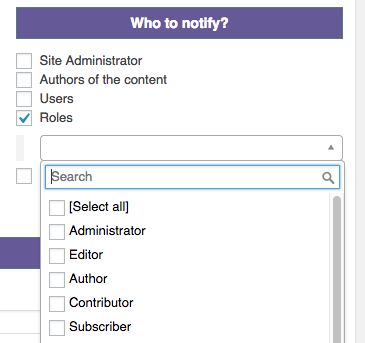 Using a slick search box, you can choose which users and roles are being notified about a post. For example, these users and roles will now get an email whenever an editorial comment is added, or the post is moved to a new status.